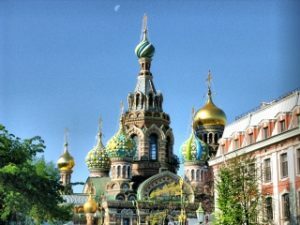 The Cathedral of the Saviour on Blood (it’s official name is the Cathedral of the Resurrection of the Jesus Christ, and russians call it “Spas na Krovi”) is one of the main sights and tourist attractions of St. Petersburg. The name is referring to the blood of the russian Tsar Alexander II, who was killed on that place in 1881. The construction of the Church had started in 1883 under Alexander III, and was finally completed during the reign of Nicholas II in 1907. It is famous for it’s richly decorated facade and onion domes. The architecture of the church is different from the main Baroque and Neoclassical style of St. Petersburg – it comes up to the medieval Russian architecture and resembles the churches of the city Yaroslavl and the St. Basil’s Cathedral in Moscow. The interior of the Church is completely covered with beautiful, highly detailed mosaics, mainly reproducing biblical scenes or figures. All mosaics has a very finely patterned borders.